"Good evening my fellow German citizens. It is in your best interest that I as Chancellor speak to you concerning this matter of great national importance. 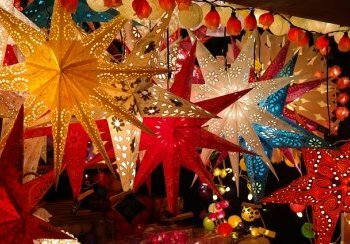 As you know, this is the Christmas season and one of the many traditions that we as Germans look forward to is shopping in the open air Christmas markets where we all enjoy the holiday spirit and the festive occasion with our friends, family and loved ones." "Unfortunately, due to our country's changing racial and religious demographics which we the German Government can't do anything about, there is a certain sector of our society who are not European and who may take umbrage to this very German and European tradition and they may use the occasion when people are so caught up in the shopping and merry-making to impose their own indigenous culture upon us. It is usually by force whether we like it or not. And as we all know, when such a culture is forced upon us, it is never a pleasant experience. Like what happened in Berlin last December. That said, it is something that we Europeans have grown accustomed to in recent years and not just at Christmas time. If you doubt me, just ask anyone of your friends from England, France, Belgium and Spain not to mention your fellow compatriots who have experienced it first hand and lived to tell the tale but lost a family member, loved one or a friend." "So it is in the national interest and for your personal safety, that I, Chancellor Angela Merkel hereby state that the open air Christmas markets will be cancelled indefinitely in order to avoid a clash of cultures. If you must shop, do so online where it is safer and more convenient or shop in the malls. Although frankly speaking, you may be just as vulnerable there as you would be in the Christmas markets. So if you must shop in the malls, do so at your own risk. Your personal safety will not be guaranteed. Thank you my fellow citizens and do have a safe, politically correct and carnage free Christmas." THERE IS NOTHING MORE OFFPUTTING THAN PEOPLE SPOUTING ABOUT ARTICLES THEY CLEARLY KNOW NOTHING ABOUT. I DO NOT KNOW.